12 Stones were formed in the small New Orleans suburb of Mandeville, Louisiana. The group was mostly still in their teens when they formed the lineup of vocalist Paul McCoy, bassist Kevin Dorr, guitarist Eric Weaver, and drummer Patrick Quave (who was shortly replaced by Aaron Gainer). After performing no more than twelve live performances, they took their demo to New York City and performed at an industry showcase. The band ended up signing to Wind Up Records to record their debut album with producer Jay Baumgardner. The 12 Stones album self-titled album]] saw a release in 2002, less than two years after the formation of the group. More success came to the band in 2003, when McCoy duetted on "Bring Me to Life" with Evanescence, which became a smash hit and was included on the Daredevil soundtrack as well as Evanescence's debut album, Fallen. 12 Stones released their second album, Potter's Field, which featured a heavier, more guitar-driven sound than their debut. After taking a break from music to spend time with their families, the band reconvened to make their third album. 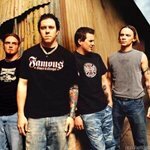 Inspired by the effects of Hurricane Katrina on their hometown, 12 Stones recorded Anthem for the Underdog in Memphis, TN with Justin Rimer and Skidd Mills during the better part of 2006, and the album was released in 2007.